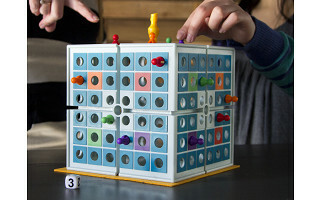 Easy to learn and fun for people of all ages from 6 year olds to grown ups, Squashed was created by Nick Metzler to encourage players to think in three dimensions, strategically positioning themselves to squash their opponents and to avoid getting squashed along the way. The object is simple: Be the last pawn standing. 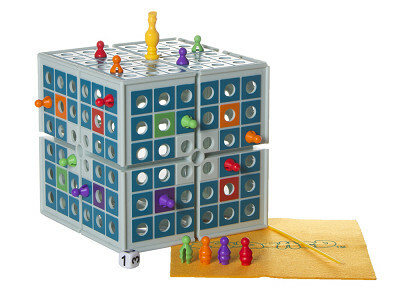 Eliminate one opponent at a time by landing on or passing over another player; or, peg your way to the King to gain the power to flip the cube and wipe out all the pawns on an entire side in one satisfying squash. But, watch out or you just might be the one getting Squashed. It only takes about 15 minutes to play, and in addition to being fast-paced, it’s a breeze to clean up. The cube itself contains all the pieces and instructions inside. When the outer box gets battered as any beloved game will, Squashed and its contents stay in tact and ready to play whenever you are. 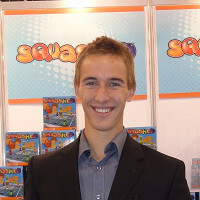 Easy to learn and fun for people of all ages from 6 year olds to grown ups, Squashed was created by Nick Metzler to encourage players to think in three dimensions, strategically positioning themselves to squash their opponents and to avoid getting squashed along the way. The object is simple: Be the last pawn standing. 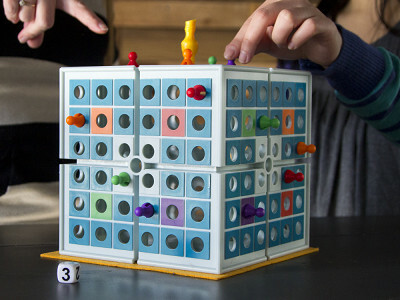 Eliminate one opponent at a time by landing on or passing over another player; or, peg your way to the King to gain the power to flip the cube and wipe out all the pawns on an entire side in one satisfying squash. But, watch out or you just might be the one getting Squashed.